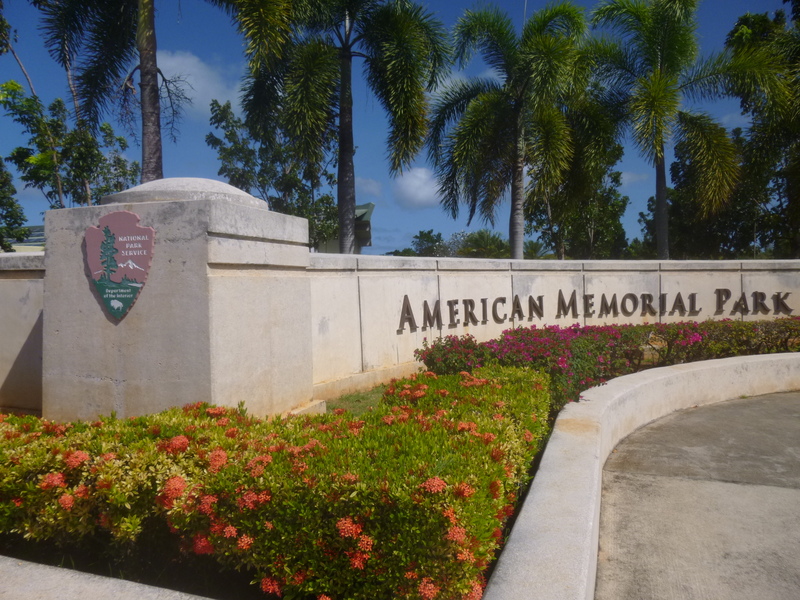 Today I was looking forward to visiting the American Memorial Park – the US National Park on Saipan. 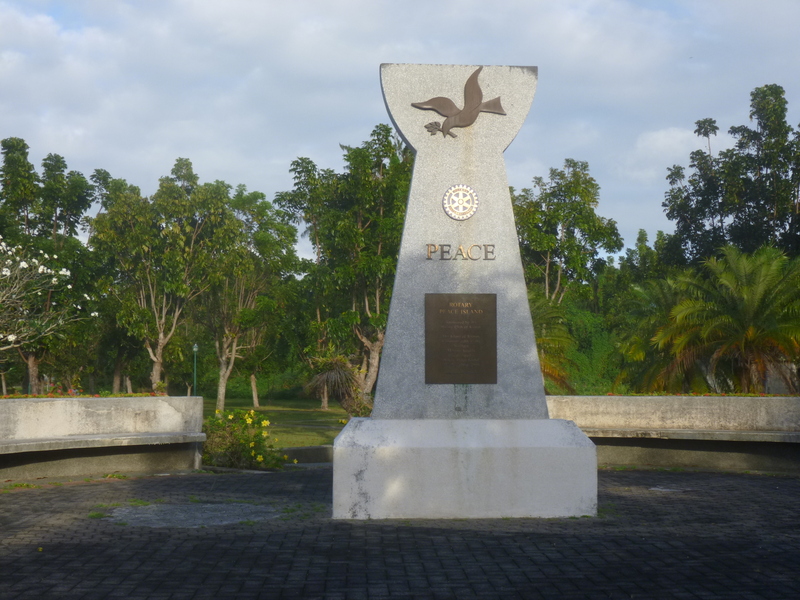 This park is a memorial to the American and Marianas people who lost their lives in 1944 during World War II (about 5,000 Americans and Chamorros, compared to about 30,000 Japanese – all on this tiny island). There’s a beautiful circle of flags of all the military units, and there’s also monuments that list the names of all the people who died. The grounds are very pretty, and I saw a trail that I’d walk on later. Then I headed to the Visitor Center to see what I could learn. 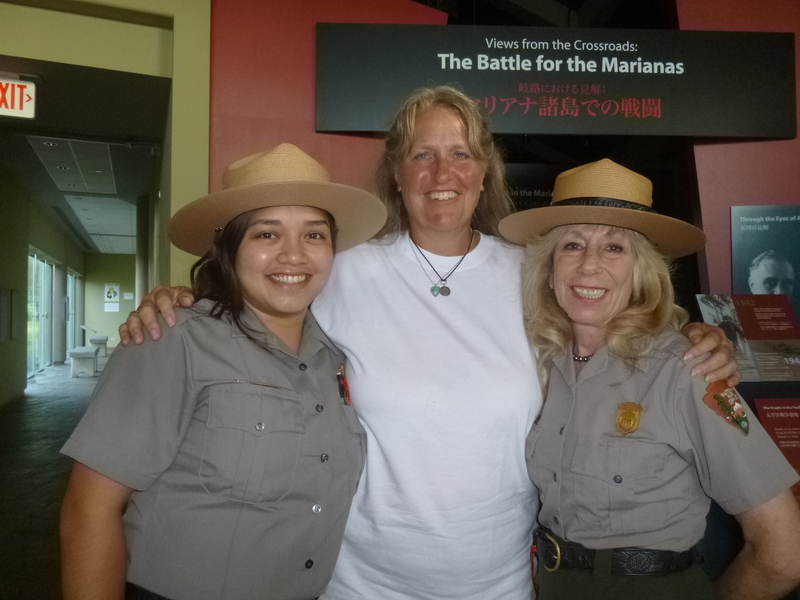 I asked one of the rangers, Susan, about the park, and we got to talking…a lot. 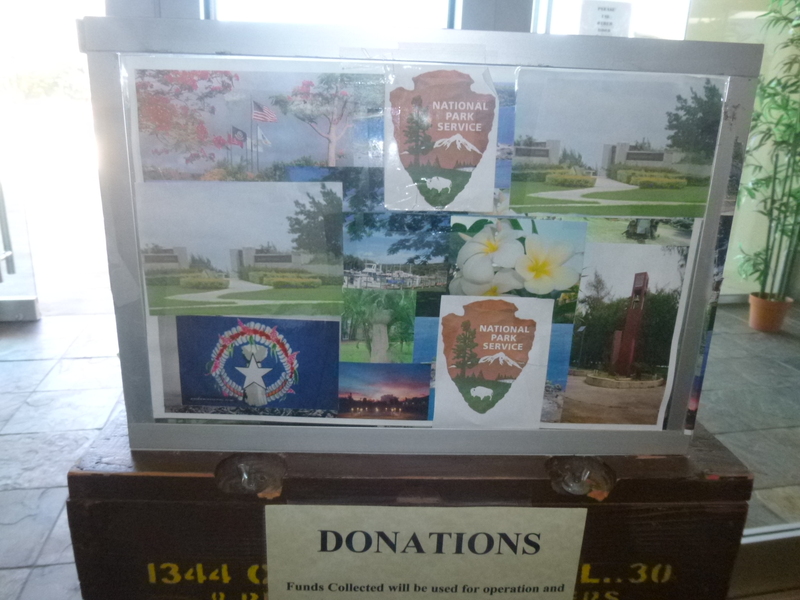 I explained what I was doing, and the rangers were wonderful about coming up with suggestions for donations. 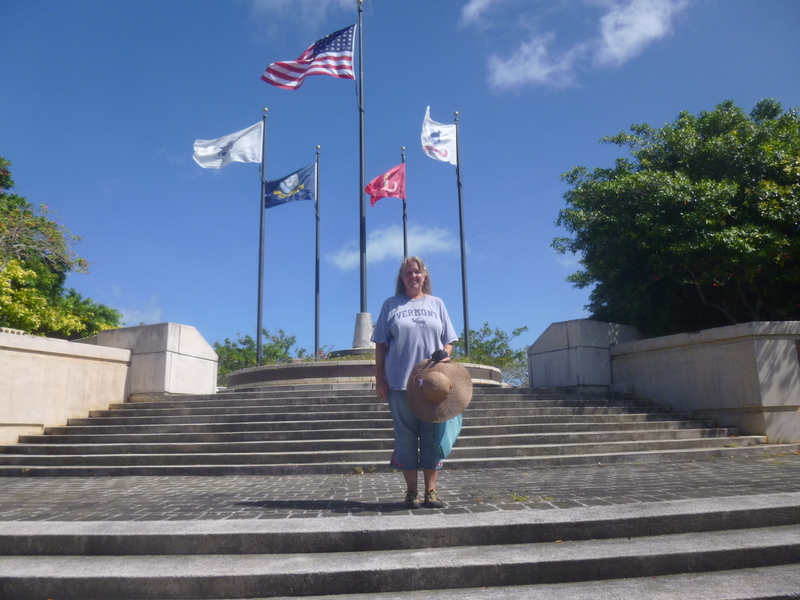 I started out with a donation to the National Park, as I had done on American Samoa and Guam – and I learned so much here. I feel like I’ve learned more history in this month on these Pacific islands than I have for the last couple of years! Susan even offered to drive me down to the Karidat Food Pantry place after lunch so I didn’t have to walk all the way back down there again. I looked through all the exhibits, and read a lot of first hand accounts. With occasional flashes of light and the sounds of gunfire in the background, all the displays become a little more real. And then I watched the 20 minute video about the Battle of Saipan, and it was so well done that I knew I’d come back to watch it again. The national park seems to be getting a lot of Chinese visitors, and when I watched the video, it was in Chinese with English subtitles, because I was the only American watching. They told me to try to come back on Sunday when it’s less busy, and then I could watch in English. The video explained how vicious and savage the 3 weeks of fighting were, and how crucial it was for Japan to maintain control of the islands, but it was clear pretty early on that was not going to happen, because they had no way to get replacement troops or supplies to the island – Japan’s empire had become very large, and she was unable to defend all of it. And the Japanese warrior’s code forbade surrender, so when defeat was imminent, their commanders committed suicide in a cave, and that was just the beginning of hundreds of Japanese soldiers and civilians leaping to their deaths from the cliffs by the ocean that are now called Banzai Cliff and Suicide Cliff; a very disturbing event at the end of the battle. More on that when I visit those places. At this point I enjoyed getting out in the fresh air for a couple miles of walking – the trail in the national park went through a pine forest and back out by the sea. 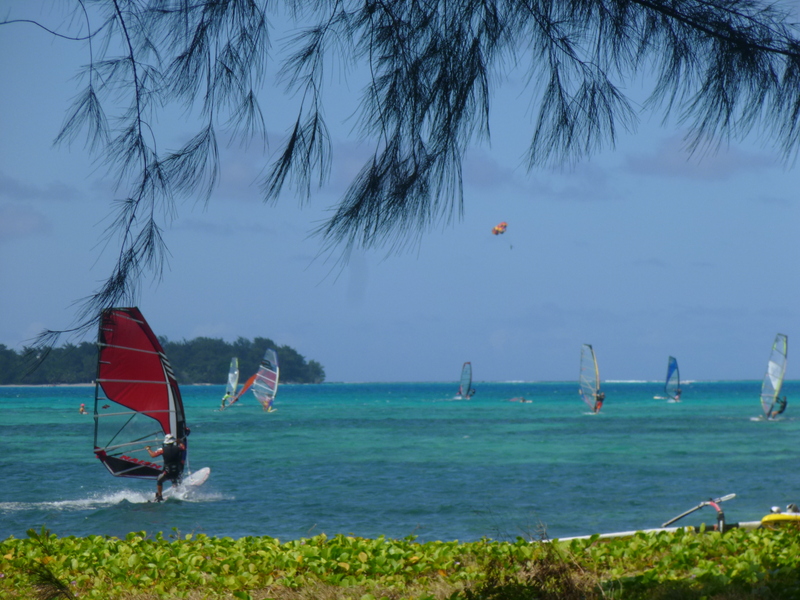 There were a lot of windsurfers out – I’m not sure if there was a race or something going on, but they were really zipping along! Then I went back to the Visitors Center where I enjoyed a bite of lunch, compliments of the rangers, and while I was out walking, Susan had called one of the newspapers about my story. We headed out in a national park vehicle to the Karidat Food Pantry, and stopped at a newspaper office for a photo first. 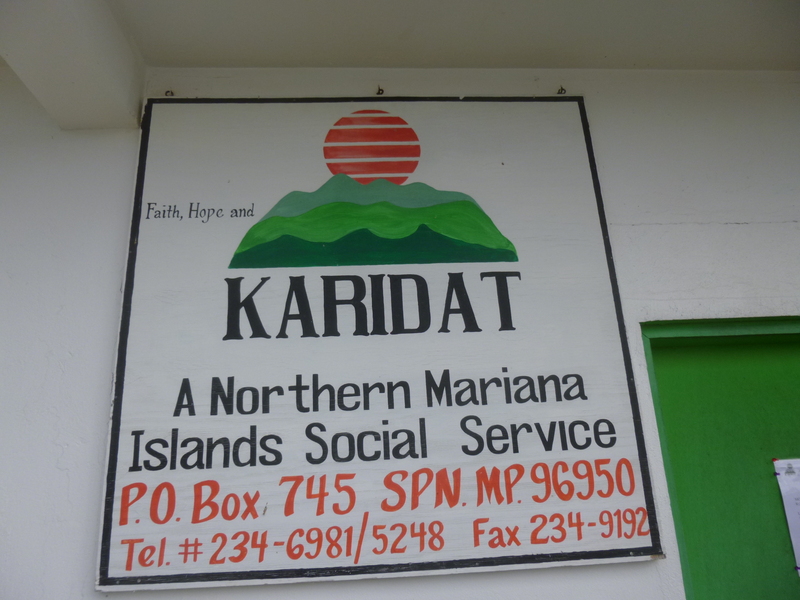 The Karidat also oversees the Guma Esperansa Women’s Shelter (House of Hope) and it’s the only one on the Mariana Islands. I made a donation to both groups, and was very happy to have learned about them. The lady at the Karidat liked what I was doing, and wondered if the newspapers had been contacted, and apparently she proceeded to contact the other paper, because when we got back to the Visitor Center, a reporter was there – a charming young lady originally from the Philippines named Clarissa. We sat down for an interview even though I’d only been on Saipan for 2 1/2 days and she recorded the conversation and took a bunch of notes. She told me she’ll let me know when the article comes out! By then, the Visitor Center was closing up for the day, and I headed out to walk to the Thursday evening Street Market. This time I was hungry, and many booths were offering 5 and 6 choice dinners for $5, and they’re not shy about proportions! I had to walk around to all of them to find what looked most appealing – many had BBQ on a stick, and fish dishes, and everyone had rice and noodles. There were some good looking vegetables and some unusual looking desserts. I ended up with several veggies and some chicken and pork, and fried rice and noodles – all eaten (or slurped!) with chopsticks – it was a good thing the rice was a little clumpy so it would balance on the chopsticks! People were eating on bleachers while waiting for some entertainment, and a couple singers came out, but it wasn’t holding my attention. Knowing it was going to be kind of a dark walk back to the motel, and it was starting to sprinkle, I decided not to hang around for some of the cultural dancing that was going to be performed later by some local studios – it was just going to be too long to wait. So I headed back after a very full day, and was glad I did, because it started pouring shortly after I got back. 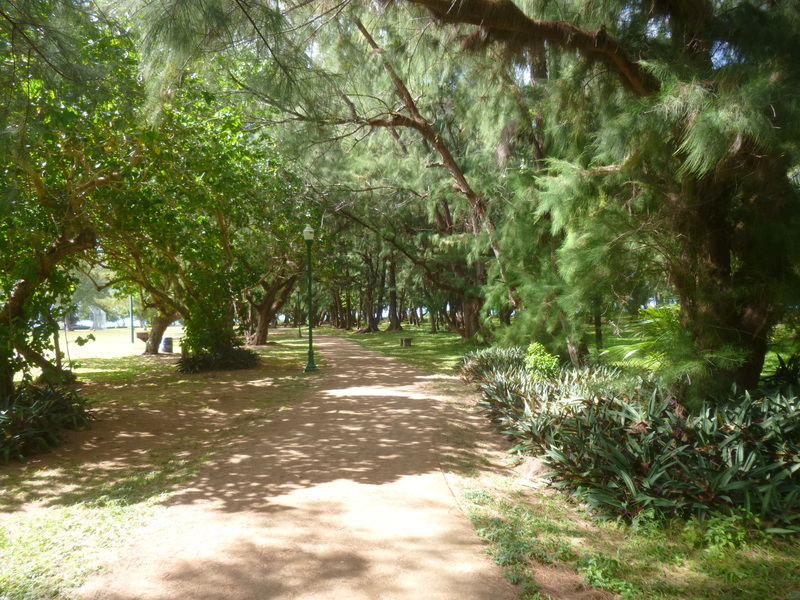 So it was great day, and I met a lot of nice, helpful people, and got caught up with donations, and I’m loving Saipan!